It has been an adventure with differing opportunities and challenges. Personal, academic and professional development would be the sum up of what I have achieved in the journey so far. For Sri Lankan-born Manela Gunawardena, studying at the No.1 university in Australia was important to her, as she knew Melbourne Business School (MBS) graduates are highly sought-after among global employers. This, together with her sheer passion, commitment and dedication would give her a competitive advantage for career advancement within the financial industry. During her studies in the Master of Management (Accounting and Finance) which she is about to complete at the end of this year, Gunawardena has had some amazing experiences that have not only developed her professionally, but have also provided her with personal satisfaction too. How was your experience with the Global Business Practicum (GBP) and Melbourne Business Practicum (MBP)? The degree was quite flexible. This allowed me to participate in both the GBP and MBP. These enrichment activities give a different perspective to learning – an aspect I thoroughly enjoy. Our group worked as actual consultants on real-life business challenges. This helped me fine-tune my soft skills, which I am certain will be advantageous in my future career plans. I was able to achieve much more than I was expecting through the GBP; so much so that it actually enticed me to apply for the MBP to have the opportunity to experience a similar challenge, but locally, in Melbourne this time! It’s worked out well as I’m currently working part-time at Discover Financial Services where I completed the practicum. My current role is to assist in financial services, and advising the financial advisers of my team, and work on buying and selling financial assets. It also includes updating details about current financial assets held through software for our clients based on the financial advice provided. I will transition into full-time work when I finish my degree at the end of this year, so I am particularly grateful for the opportunity. 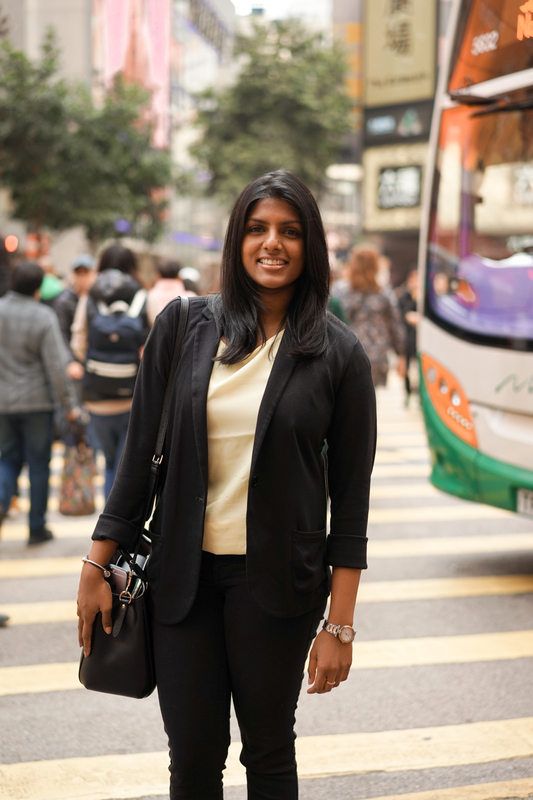 Malena Gunawardena in Hong Kong for the Global Business Practicum in January 2017. Did you receive any scholarships and how have they helped you? I was awarded the Eric Ingram Prize for Project Finance and the International Graduate Merit Scholarship. This helped me to understand that all the hard work I have put in has finally paid off to an extent that has surpassed my expectations. To be a scholarship holder at the Australia's top university is indeed an amazing accomplishment and has really helped me financially. You’ve studied accounting and finance right from your Bachelor degree and I can see you’re passionate about these areas. What do you enjoy about them most as a combined discipline? I really enjoy working with numbers! Back in high school, I wanted to pursue a career in consulting and my end goal was to have my own consulting firm. I suppose the interest towards Accounting and Finance mainly stemmed from this. I decided to pursue my masters in the same field because I wanted to broaden my knowledge on the same specialities. I’d say my favourite would be Finance as I find it more challenging, and therefore rewarding, compared to the nature of Accounting. How has studying this program impacted on your career development? It has helped me to understand what employers look for in graduates in today's competitive job market. On top of academic learning, I have been able to develop soft skills such as presenting, problem-solving mechanisms, ability to pay attention to detail, and research aptitude. In addition, academic enrichment programs have also given me the opportunity to develop as an individual as well as a young professional stepping out into workplace. The challenging structure of the course allowed me to have a feel for the more practical aspects of working, an important factor when stepping into the business world. Why did you choose Melbourne as a destination? The main reason I chose Melbourne was the cultural and diverse background it offered. I love the emphasis it places on diverse cultures and how it is elaborated through vibrant cultural music and food festivals. I was also attracted to the emphasis placed on education in Melbourne coupled with enriching activities. What are the advantages of living and studying in Melbourne? Melbourne Business School is very conveniently located to the city's best amenities, from fresh produce at our local markets, to some of the world's best cafes, to the museums and galleries. The vast array of activities and festivals in Melbourne have ensured that I enjoyed my time here. I also love travelling and Melbourne has been perfect for this. I have seen quite a bit of regional Victoria, and as a photography enthusiast, it has been absolutely wonderful to be able to capture the change in seasons in each of these places. Finally, being in Australia has helped me to realise the potential of working with a diverse individuals, and I love the multi-cultural environment Melbourne has created for itself. Would you recommend the University of Melbourne to students in Sri Lanka who are considering studying overseas? What advice would you offer them? Yes I would. 100%. I believe that there is much one could experience by being part of UoM, diversity being the top of the list. It is not just an educational degree but an experience full of new learnings. The extracurricular activities and enrichment activities are at the heart of an unforgettable journey one will be on, should they decide to study here. Melbourne Business School runs information days in cities all over the world. Find out more about MBS Enrichment Programs here. We host a number of information session in Australia and around the world! To see a full list of where we will be for the rest of the year, visit the events website to view upcoming Education or Information Fairs.